The Elan g1 was released as an economical entry point into the Elan g! 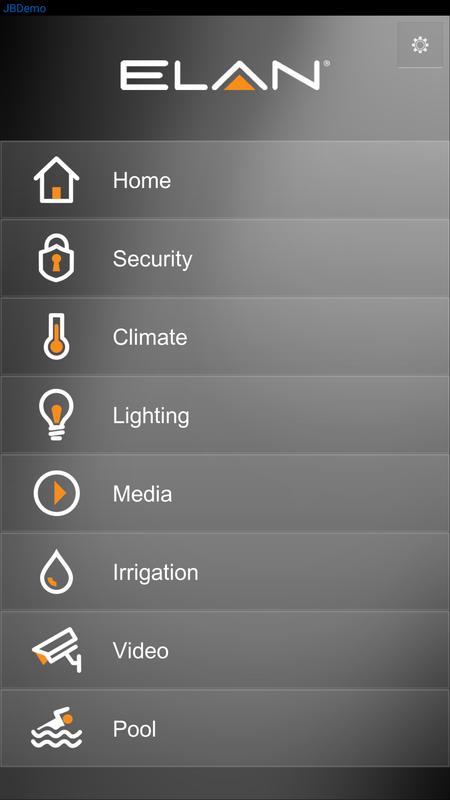 home automation platform. 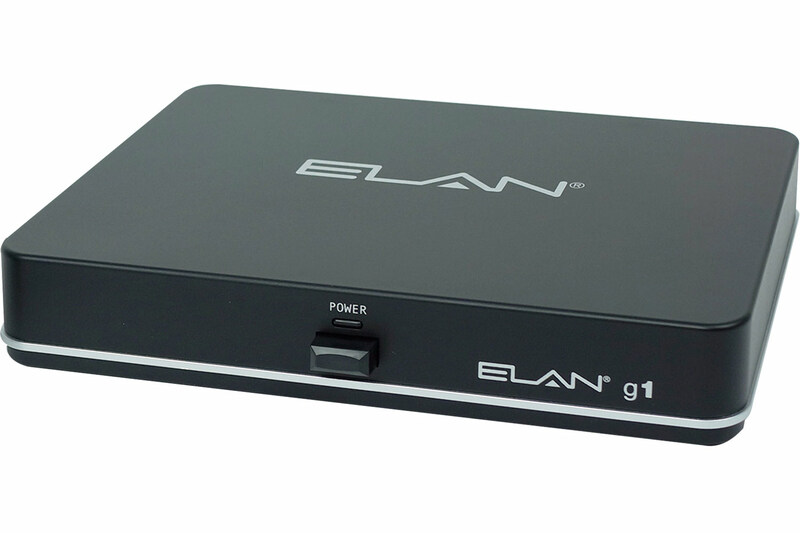 Historically, the minimum entry level to achieve control from mobile devices and a handheld remote control was upwards of $2200 just for the base hardware, but the Elan g1 now lowered that price tag to just $800. This now makes the g1 a great option to control a system even as small as a single media zone, while still providing the same level as performance as the gSC2 and gSC10 system controllers. Let’s talk about the different features of the Elan g1, why you need them, and how they are different. The g1 is sold in a box that also contains a remote control. This is a very simple, basic remote, but it packs the full punch of Elan g! home automation. There are typically 4-5 different remotes necessary to control a media room with a surround sound system. There is a remote provided by the cable company that’s used to watch TV and turn the display on and off. There is also a remote to turn on the surround sound receiver and switch it to the correct input. 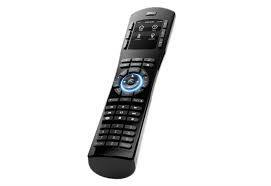 Then there are also different remotes to control each sources such as an Apple TV or a Blu-Ray player. At least two remote controls, and 4-5 button pushes are required to simple turn the TV on to watch it. The g1 remote control appears to be a dead replacement for the cable box remote, but it’s actually just a way to communicate to the g1 controller that has serious intelligence and power. In a properly programmed system, simply hitting the button labeled “TV” will prompt the g1 controller to turn the TV on, turn the surround sound receiver on, switch both TV and surround sound equipment to the correct input, and then give you control of the cable box. This is perfect for people who are easily confused by multiple remotes, or guests that don’t frequently use the system. If desired, the power button on top can be programmed to tune the system directly to watch TV. There is a similar button on the remote control that says “Movie” that could automate a similar process to watch Apple TV or a Blu-Ray player, and then provide you full control of the device from the same remote control. Best yet. the g1 remote control does not need line of site to the different devices in order to control them. It simply needs line of site to a small device mounted to the TV called an “IR receiver”. The rest of the equipment can be in a cabinet behind closed doors. Not only is the system easier to use, but it can also be made to look cleaner and more elegant. As part of the standard Elan g! platform, the remote can do more than just control the audio and video system. It can control the lights as well. If you’ll notice, at the top of the remote control there are two buttons that can be programmed to control the lights. These buttons can be programmed to turn the lights on/off, to put them to a preset scene, or to raise/lower the brightness. 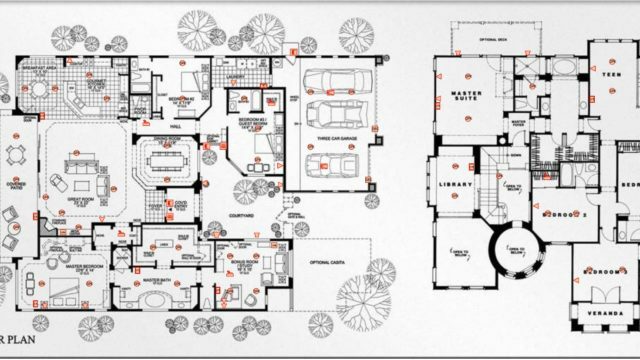 Remember that the point of the g1 system is not just to have a universal remote control, it’s also to create an interface with which to control your smart home devices. 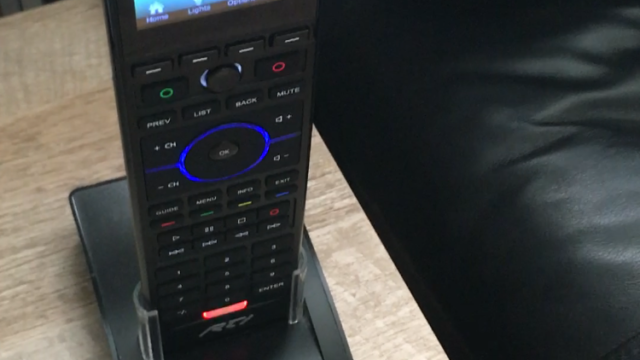 Obviously, a remote with no display would have limited capability to do so, but by hitting the “OSD” button the TV is turned into a control center. The Elan g1 OSD extends control of the media room by displaying data from a streaming media device such as a Sonos or Logitech Media Server. It’s easy to browse Pandora or Spotify stations and immediately play them to any room of the house. It also extends control of the lights so that you can view status of different switch legs and control them, again, anywhere in the house. 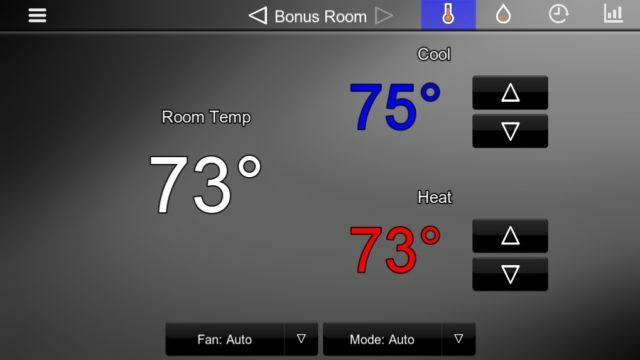 Smart thermostats are also integrated into the OSD control and allows you to view and adjust the thermostat without taking out a phone or investing in a pricey touch panel. Everything available in the Elan g! system is also available on the mobile device interface of the g1 controller. The only exception is pool, spa, and irrigation control, which the Elan g1 cannot do. Make sure to see all of the available features in our Elan g! system overview. You can also demo this control. I’ll just leave a screenshot of the new Elan 8.0 software in this post to suggest the control capabilities of the g1. 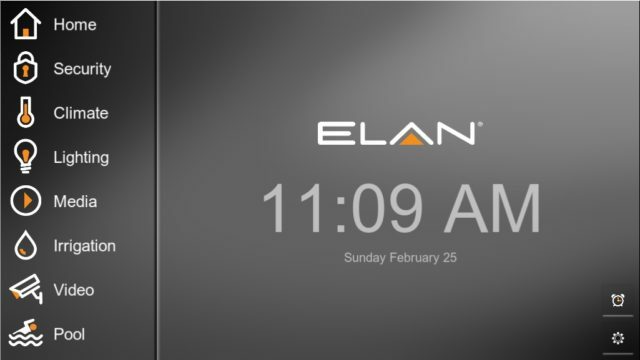 Pictured is the home screen of the Elan g1 mobile control interface. Each of the home subsystems tabs can be expanded for quick control of any particular system, or you can navigate through the app for more complex control. It’s important to note that this mobile device control is no different than that of the $2100 Elan gSC10.